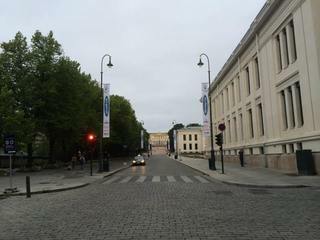 At six o'clock in the morning the streets of Oslo are almost empty. An overcast sky shades every corner, every park, every closed cafe patio gray. The light breeze is welcome after several consistently hot weeks. Leaves are still tightly bound to the branches of the full, green, summer trees. It's just me out there. Me and the city I call home. I've never seen Oslo like this before. Oh, I've seen her empty. On Easter weekend. Or after catching the 1 a.m. train home from the airport, rolling our suitcases up the hill from National Theater. But never like this. Behind every closed door and Stengt sign comes the buzz of potential energy. I am running. Downhill first. From Inkognitogata to Henrik Ibsens gate, through the heavy construction at Solli plass. Asphalt peeled back to reveal old tracks and new track. Rust at the joints. Workers in neon vests sip coffee. All this downhill is a gift to me. It's tough enough to motivate myself out of bed in the morning. To lace up my old sneakers (new shoes will be my reward for successfully completing the Oslo Half Marathon in September). My footsteps are quick and even. Down Dokkveien to Aker Brygge. No cars on the road. I pass the Nobel Peace Center, cross Rådhusplassen. I am alone with the statues, the fountains. Fishy smells waft up from under the piers on the fjord. The bells in the brick towers don't chime. It's only been a mile. It's only been ten minutes. My breathing is more labored than it should be, but I'm used to that by now. It's the first mile and a half that's hardest for me. A breaking in. Breaking through the wall and finding a healthier part of my spirit. I skirt the perimeter of Akershus Fortress. No cruise ship parked where I expect it, so the fjord view is open to me. Islands. Sailboats. Ferries. Rounding the corner, I see the Opera House. It is an iceberg. Pristine. Not a single person on the terraced roof. And faster than I expect, I am running along Operagata. Three men exit a beige sedan carrying musical instruments in bulky, black cases. Cyclists whip past me wearing black spandex, neon vests, helmets. They are on their way to work. I am suddenly anxious. This is where my path will deviate from what I've run before. As a reluctant runner, I find blazing new trails joyless, even stressful. But this is a necessary part of my training. I'm piecing together the half marathon course one segment at a time. Nordenga Bridge rises ahead of me. I run up. It's another deal I make with myself. Never walk uphill unless I must, but if I run up, I get to breathe at the top. Not sure who enforces these rules. My subconscious? I take the stairs at the far side of the bridge. Carefully. My knees wobble. Platous gate, then Tøyengata. This is what I"ve been preparing for. The new segment circles Oslo's Botanical Gardens, and that's a climb. For me. Seventy-odd feet in less than a mile. On race day, it'll be about Mile 10. I predicted it would crush my soul. I was wrong. It's not easy, but I run all the way up. Monradsgata to Sofienberggata. Then left on Sars gate and it's over. Downhill. Blessed downhill. From the neighborhoods I can smell the bakeries, coffee roasting, gasoline, rubber, fresh fruit. Plastic crates slam together and wheels rattle on concrete sidewalks. My feet are warm, too warm maybe. A blister on the ball of my right foot gives me a stabbing pain. But I'm still moving. Breathing deeply. Healthfully. I am strong. My gait is quick, even, consistent. And I'm not tired now. Passing the four-mile mark on Nylandsveien, I am returning to familiar territory. Trams rumble and wheeze through the intersections. People have begun collecting on the platforms. They carry briefcases, suitcases, backpacks. They are white, black, brown, a severely-fake orange-tan. They speak on mobiles, swipe thumbs across smartphone screens. They don't look at each other; they don't look at me. Sweat collects in my hair. My forearms glow as the sun pokes through the clouds. I take Hausmanns gate to Stor gata and approach the Cathedral from the east. This is where they had the memorial service , I think. As I always do. This is where the Prime Minister and the royal family joined the families of the victims. Was that really three years ago? Seventy-seven dead. And the city awash in roses. Fear. Just for a second. The threats came in last week , and the city's reaction was visible everywhere this weekend. Police officers walking the streets and metro platforms were armed. Parliament and the palace suspended tours. Every time we boarded a bus or tram, my heart skipped a beat. Because we know what terror looks like, and we're afraid to see it here again. But then I'm past it. Running. I've finished my fifth mile, and I could stop now, but I don't want to. I'm on Karl Johans gate and my feet continue to pound the pavement. The palace is pale yellow, bright at the top of the hill. 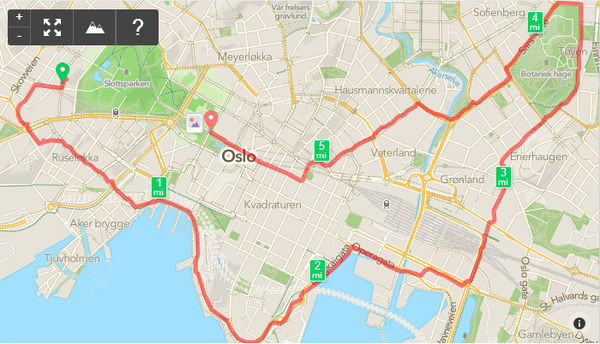 On my left is the yellow-brick curve of Stortinget. This is one of the places the terrorists would want to attack. It is symbolic of justice, fairness, democracy, and a successful, generous society. A man hoses off the sidewalk outside his kiosk. I smell the wet pavement. Newsprint. And the last half mile. It's a breeze. This is my city, my home. In the early morning, as trucks unload their wares, before the street performers can paint themselves copper and get into position, I see Oslo in a whole new light. Just us. And I love it.